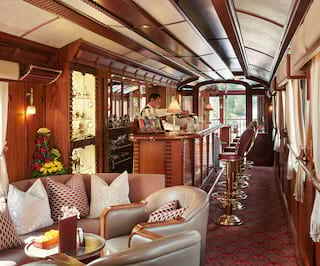 Back in the days of the original Orient Express, it was possible to buy certain carriages. During the 1900 Universal Exhibition in Paris, the carriages were showcased and the aristocracy fell in love with the level of luxury. Opulence is the word. The three new suites take up an entire carriage. Each is uniquely designed to reflect the spirit of the city they are named after: Paris, Venice and Istanbul. 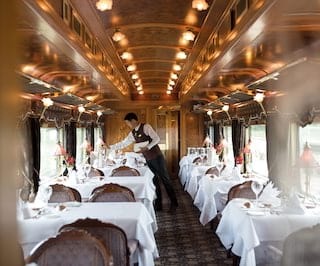 On a train renowned for timeless art deco details, black tie dinners and cocktails by the piano, the Grand Suites offer a whole new level of luxury. 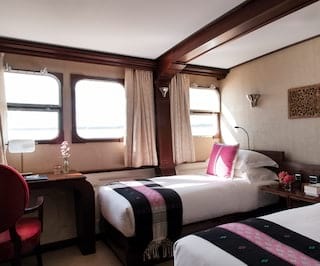 Anticipate plush double beds, marble en-suite showers, private dining, and free-flowing champagne. To create something this spectacular requires authenticity. As Pascal says, “Silverware should be heavy, a door handle should be heavy, a crystal glass should be heavy... That’s the way luxury has always been.” And authenticity requires the very best craftspeople. Pascal, along with Chief Engineer Jean-Marie Moreau, sought out artisans at the top of their respective fields who shared a passion for the history of the train. We set off to see some of them at work. The first stop is Verrerie du Marais, a glassblowing workshop on the outskirts of Riom, France. Here we meet Nicolas Diverchy. Nicolas trained in glassblowing throughout France and Sweden. Today he works to ensure this vintage craft is as modern and fashionable as ever. His boutique is an Aladdin’s Cave of multi-coloured vases, lamps and artwork. The adjacent workroom is a whole other world; a den of raw products and barbarous-looking tools, dominated by the glowing central furnace. It’s temperature is kept between 1000°C and 1500°C. 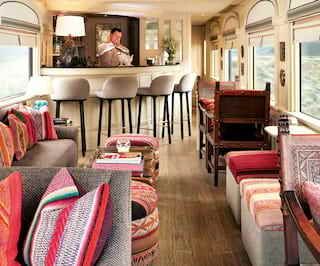 Nicolas has been tasked with creating the spectacular glass sinks and delicate light fixtures for the train’s suites. He begins with base elements, layering them with coloured glass for splashes of vibrancy. Most of his materials are locally sourced, while some were donated or salvaged. He rotates between the blistering heat of the furnace and several other stations in lithe, well-practised movements. He uses iron pincers and borers to shape, and nothing but a stack of damp paper and an ungloved hand to cool and smooth the red-hot material. The work feels both elemental and theatrical. However the show is a quick one, as Nicolas works fast. “The quality is not in the time, but in the process,” he quips. As a final flourish, the sapphire-blue glass is cut and blooms outwards, and it is twisted and turned with expert precision to let gravity shape it into delicate petal-like edges. Nicolas explains, “With the twists and the layers, it’s like capturing motion.” It’s a fitting quality for the world’s most romantic journey. Next up, we travel to the train depot near Clermont-Ferrand where work is still underway on the train’s new carriage. 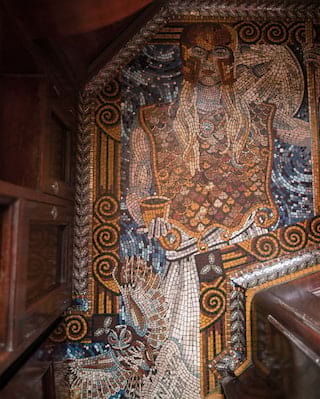 Here we meet famed mosaicist Jérôme Clochard, an expert in the restoration of ancient mosaics. 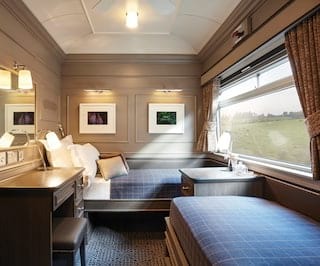 Previous projects have seen him work on opera houses, including the Palais Garnier and Opéra-Comique in Paris, as well as on our very own Belmond British Pullman train. Compared to the spectacle of the glassblowing workshop, Jérôme’s work is marked by finesse and precision. There are no wrought iron pincers or roaring flames; one of his most precious tools is a gleaming, delicate pair of tweezers. Materials including marble, onyx, Venetian granite and Italian glass are cut to unfathomably precise small sizes called ‘tessels’. Then Jérôme carefully works them into the template he has drawn, adding them upside down in a method called ‘indirecte’. When he is happy, they are placed and sealed to make them strong and water tight. Last but by no means least, we head to meet Philippe Allemand—the man responsible for the marquetry, one of the train’s most striking and memorable features. Considering that the art form seems like such an old-world treasure, Philippe’s atelier is incredibly modern, and his talented team are younger than many would anticipate. 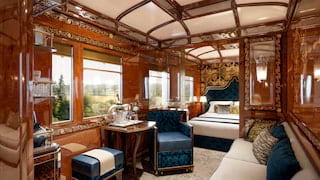 His relationship with the Venice Simplon-Orient-Express began in 1997, when he was commissioned to restore one of the sleeper carriages. 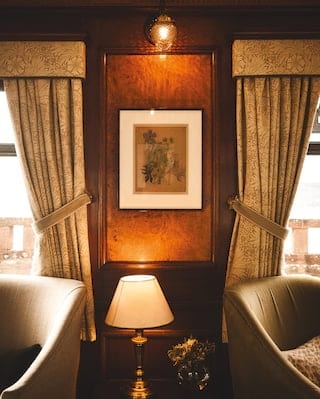 Since then he has had a hand in almost all aspects of the train’s marquetry and wood panelling, treating the carriages like a collection of old friends. The marquetry process is incredibly delicate. To add to the luxe feeling, Philippe sticks to exotic woods, many of which are antique finds he salvages from closing down workshops. Each layer of wood is shaved to a thickness of between 0.6 and 0.9mm, cut using a specialised 1mm saw, carefully layered into position, and fixed together using a glue that is brewed on-site using fish bones. “Each 3cm of marquetry could contain between 8 and 10 individual elements. Therefore each large panel can contain several hundreds or thousands of pieces,” Philippe explains. The level of artistry and finesse is well rewarded, however. 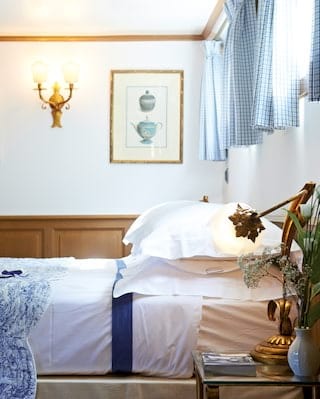 His work is visible in almost all aspects of the Grand Suites, including the walls, cupboards, beds and doors. We believe in the art of good living. Living well within a work of art makes perfect sense.